This is now the third BioShock game where we have not had much in the way of working class (or middle class) heroes. I can understand that Levine probably didn’t want to show favouritism between Comstock’s followers and the Vox Populi, but there are no redeeming members among the group once the uprising begins. Power always corrupts, it seems. The way that Fitzroy turns on Booker, the madness that she exhibits and then spreads to her comrades in arms – I just thought that by now at least some of the parties involved in a BioShock game wouldn’t go mad and try to kill you. It’s repetitive and no real development in terms of portraying the world in comparison to the previous games. At least having some of the Vox not trying to kill you would have made sense, but having them all blindly following Daisy’s orders seems weak as a plot device for a group of people that’s done taking orders. And there’s no recognisable foreshadowing earlier in the game that predicts the turn Daisy ultimately takes. It seems that being in another universe by the point that Daisy gets to Fink is reason enough for her to have lost the plot. And the downfall is made even harder to swallow when you remember that the Vox are who they are due to racial discrimination. It’s like all the worst stories non-Irish, racist white people use to tell themselves to justify their inhumanity is perfectly founded in reality. The case of the alternative Fitzroy being as mad as a hatter in comparison to the one you first meet on an airship is but one instance of the plot being left to explanation by the existence of alternative realities, with no cause and effect demonstrated in the reality itself. Then there’s the case of Mr Chen and anyone else who was dead in one reality you were in and then isn’t when you go to the next one, but this somehow messes the ones that were alive and fine in the new reality… up? And let’s talk about this hand of Booker’s, the hand that will have been clearly on display at the beginning of the game when he’s in the temple of Comstock’s followers. These, we are led to believe, are some of Comstock’s most devout and knowledgeable flock, and yet they don’t see or remark on the “AD” carved into the back of Booker’s hand, which will have been perfectly visible while the priest half-drowns Booker. Everyone in Columbia has had it drummed into them that having “AD” on a right hand means that the hand’s owner is clearly the “False Shepherd” and it’s made clear that Comstock doesn’t want Booker about – he really, really doesn’t want him there. But hey – let’s have his most fervent believers allow Booker to waltz on into Columbia. Plus there’s the jars of Elizabeth’s “things” in her tower. If there had been one way to convince Elizabeth for good that Comstock and the rest of Columbia were bad news, it would have been to have kept heading down, Songbird or not, and letting Elizabeth see the towel from her first period suspended in a jar. This super creepy element, however, is left to just drift on by – and never be remarked upon by anyone other than an unfortunately eagle-eyed player. I can’t really flee the alternative reality stuff here, it’s how the whole ending of the game is able to come together. Or not, because the game has also identified that not only is space malleable, but time is too. That’s why we’ve got lighthouses that can take you straight to Rapture, which was built way after Columbia, and why (previously) you witness an aged Elizabeth attacking a reasonably modern New York City. While from an imagery perspective, what happens to Booker is reflective on many events that happen over the course of the game, it’s a bit pants from a plot device perspective. Here, all the moving through space and time is wobbly as an explanation for how Booker’s end here will end the cycle of Comstock. The Booker who is drowned is past the point of the first attempt at baptism – he refused it and went on to have Anna/Elizabeth and all the debts and other crap. I’m sorry, but having Booker “die” at this point is unlikely to stop the creation of Comstock, because it’s not the right branch in his existence – it’s after the split. If instead we’d been presented with a Booker who was pre-Booker/Comstock split – then maybe I could have accepted the ending. His death at that point would have stopped matters, at least in all the realities affected by that branch. And yet – having a game with multiverse stuff going on means that there will always be a Comstock, because the possibilities are endless, it would be impossible to cut down all the branches. Do I hate this game? I don’t hate it, but the whole multiverse/alternative reality plot crutch gets in the way of making the game as understandable and enjoyable as it could be. Collecting all the voxophones in the game does allow for some aspects of the world, mainly the technology and Vigors, to be explained, which is why I didn’t bring it up as a problem. But the time and space plot devices were not as well thought through as they could be. I’ll probably play the game again another time, but the perplexing nature of the story did ruin things a bit for me. 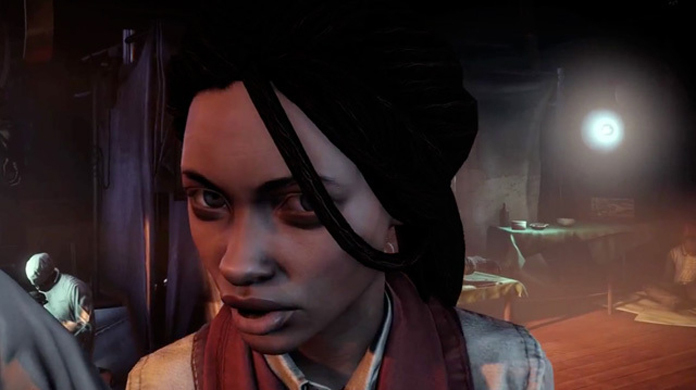 A point about the reaction of Booker at the Lighthouse; I watched a BAFTA Q&A with KL and he pushed the voice actor – Troy Baker – to underplay his acting thus allowing the player to do the reacting not the game. Still I agree that I prefer a little more emotional prompts from the characters. Talking Troy, I feel his role(Joel) in The Last of Us will be far more engaging.